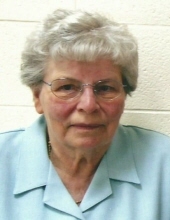 Marguerite Waunita Hoffland was born June 19, 1927 in rural Clear Lake, Iowa to Clarence and Violet (Raymond) Hill. She graduated from the Clear Lake High School in 1945. She was baptized and confirmed in the Methodist Church in Clear Lake. In 1947 she was confirmed in the Lutheran Church. She worked in the telephone office in Mason City and later in the office of the Clear Lake Bakery. On October 20, 1947 she was united in marriage to Edward Hoffland at the Old Lutheran Academy in Canton, South Dakota. They lived for a short time in Clear Lake before moving to a farm near Schley. In 1949 they moved to a farm near Saude and lived there for 57 years before moving to an apartment in Cresco. Marguerite moved to Cresco Assisted Living in November, 2015 before moving to Evans Memorial Home in October of 2016 due to declining health. Marguerite is survived by two daughters: Candace (Lester) Erickson from Mabel, MN and Jeanine (Dale) Schwade from Lime Springs, IA; six grandchildren: Leif (Joanie) Erickson, Peter (Jennie) Erickson of Chatfield, MN, Marcia (Justin) DeVore of Charles City, IA, Thor (Tina) Erickson of Elgin, MN, Dean (Libby) Schwade of Lime Springs, IA and Leah (Jessse) Underbakke of Bellbrooke, OH; 14 great-grandchildren: Autum and Silja Erickson, Brent, Chandler (and Aleksie), Davis Erickson, Hannah and Jonah DeVore, Torin and Tayla Erickson, Brooke, Kate and Meg Schwade, Helena and Magnus Underbakke. She is also survived by one sister, Geri Klesssel of Spring Field, MO, one sister-in-law, Violet Hoffland of Decorah, IA and many nieces and nephews. She is preceded in death by her husband, Edward in 2014, two sisters: GleeBell Waltzing and Edna Mae Morgan; two brothers: Vern Hill and Elston Hill; her parents and an infant sister, Wilma. To send flowers or a remembrance gift to the family of Marguerite Hoffland, please visit our Tribute Store. "Email Address" would like to share the life celebration of Marguerite Hoffland. Click on the "link" to go to share a favorite memory or leave a condolence message for the family.